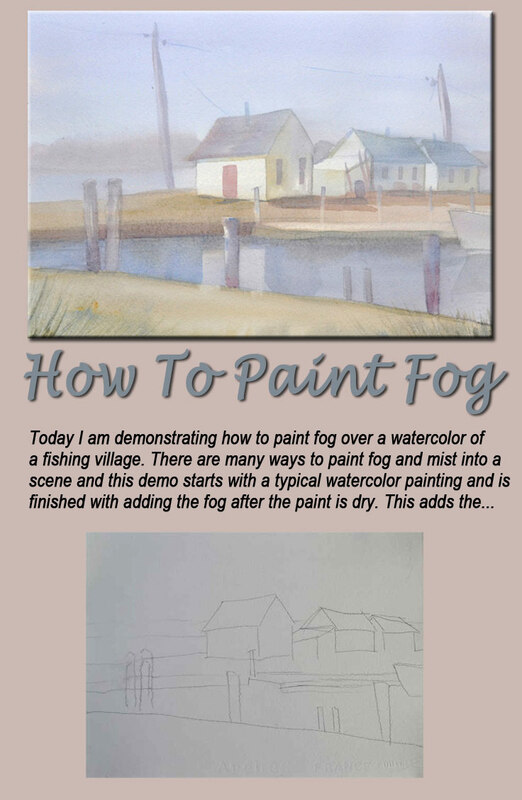 Today I am demonstrating how to paint fog over a watercolor of a fishing village. 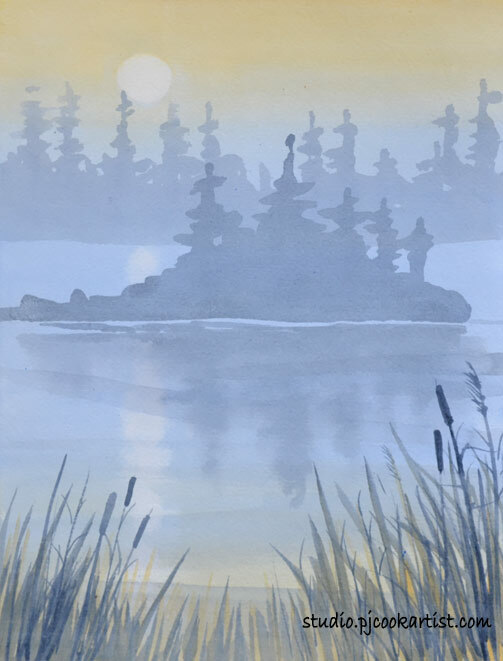 There are many ways to paint fog and mist into a scene and this demo starts with a typical watercolor painting and is finished with adding the fog after the paint is dry. This adds the fog on top of your existing watercolor painting. Above is a quick sketch in pencil on Arches 140 cold press watercolor paper. This scene is of a fishing village on Martha’s Vineyard called Menemsha. These fishing shacks have been there for many years and the village has not changed much. I am using a slide that I took 20 years ago but I think this place looks about the same today. At this point I have painted the larger areas of the fishing village in watercolor. 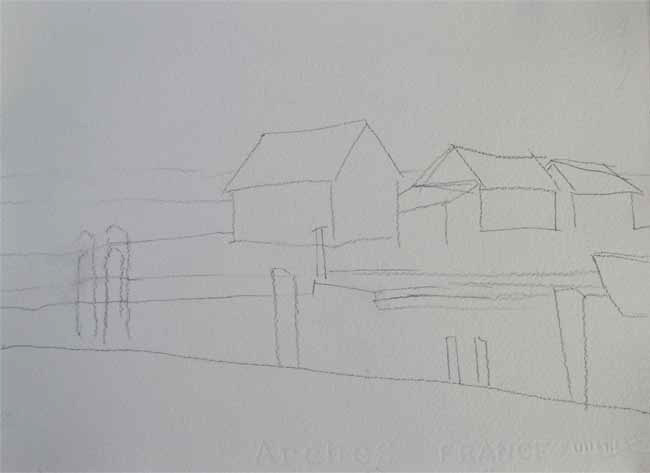 I painted around the fishing shacks as I worked wet into wet in the background sky and water. From there I painted wet into dry for the foreground areas. Below is the scene where I completed the fishing shacks after the background was dry by adding the roofs, windows and telephone poles. I completed the scene by adding the reflections in the foreground water. At this stage of the painting is when I will show you how to paint fog in this watercolor tutorial. After the paint was dry I mixed an acrylic white with cobalt blue watercolor, using a watery mixture I painted over the entire painting of the fishing village. Do not drag your brush back and forth too much. Lay in this wash of fog rather carefully so you do not disturb the watercolor paint underneath. 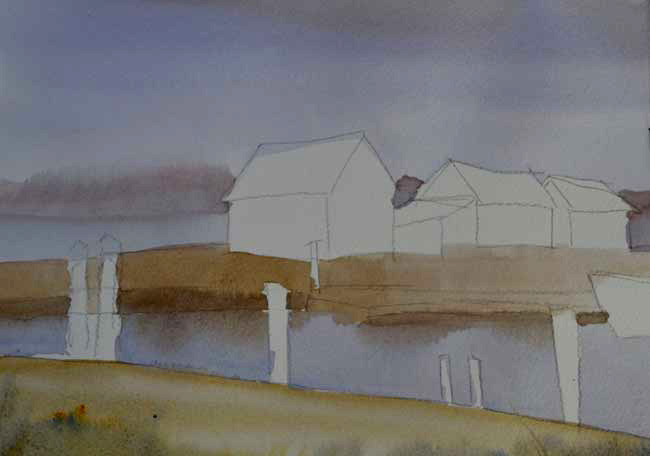 After this was dry I added another wash similar to the first one so it looked more like a foggy morning at this fishing village on Martha’s Vineyard. 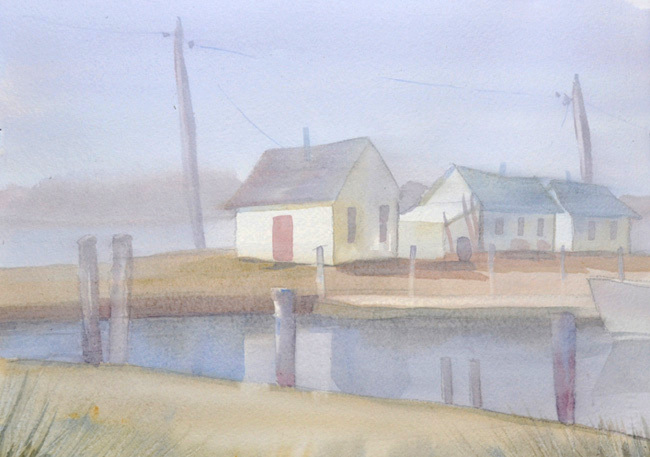 This completes this watercolor demo of how to paint fog into a completed scene. Below is another painting done with this same technique for creating fog. Hope you enjoyed this and please pass this post on for others with the sharing buttons. If you have a questions please send a comment below. Thanks! How to paint fog a painting tutorial by PJ Cook. with what you illustrated, it becomes much more “duable”. Bill, Thanks for your input, I’m glad you were able to follow along with this painting technique. Thanks Emily I’m glad you found this watercolor tutorial useful.